The amount of traction depends on tires, pavement and load. 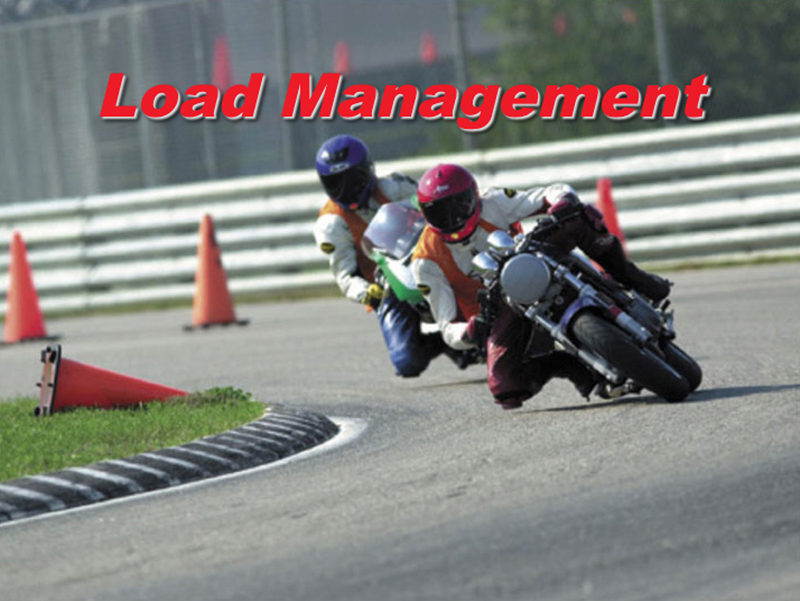 Last weekend I conducted a seminar at the Thompson Speedway (in CT) and I thought I’d share a particular concept that came up during the presentation… the concept of “load management”. When I first verbalized the term, I thought it sounded like the material for a crass poop joke. But, it is a concept I believe every motorcycle rider should adopt as a way to ensure that you have a sufficient amount of traction. Before I talk about specifics of load management, it makes sense to lay some theory on you. In its most basic form, traction is the friction between your tires and the road or track surface. This friction can vary greatly depending on several factors, including tire compound, condition and temperature, as well as the quality of the pavement surface (or dirt for you dualies out there). Pavement texture affects the amount of traction available. But wait. The quality of your tires and the surface is only part of the traction equation. The other part is the amount of load that is placed on the tire’s contact patch. The more weight or load that each tire is supporting directly relates to the amount of grip each tire has. When you brake, the front suspension compresses as the weight of rider and bike pitches forward. This increases front tire traction. But, at the same time, the rear suspension extends and the load (and traction) at the rear tire decreases. More traction on the front means you can use the front brakes harder. But, it also means that there is less load at the rear and therefore less rear tire grip for hard use of the rear brake. Load shifts constantly with every maneuver you make…braking, cornering, swerving, accelerating etc. Loads also shift with the terrain. Riding uphill shifts weight rearward. Riding downhill moves the load to the front. Riding over bumps also causes momentary shifts in load and changes in traction. Road camber also affects load. If you grab the front brake, you’ll skid the front tire. So, managing traction requires you to manage the location and amount of load. This means making sure your front tire is sufficiently loaded before you introduce maximum front brake force. Squeeeeeze the front brake lever. It also means easing off the rear brake as load pitches forward when you brake. The key is to apply the brakes only as much as the tire can handle, which means paying attention to the amount of load there is on each tire. Now, too much of a good thing is too much of a good thing. In this case, you can overwhelm the front tire while braking and skid. However, if you squeeze the front brake progressively then you should not have this problem. If you grab the brake, then you risk locking the front wheel. Managing traction while cornering downhill requires balance between speed control and acceleration. You can also overwhelm and push the front tire into a lowside skid when cornering hard. To avoid this, you need to get on the throttle just after you initiate lean to balance load between the front and rear. 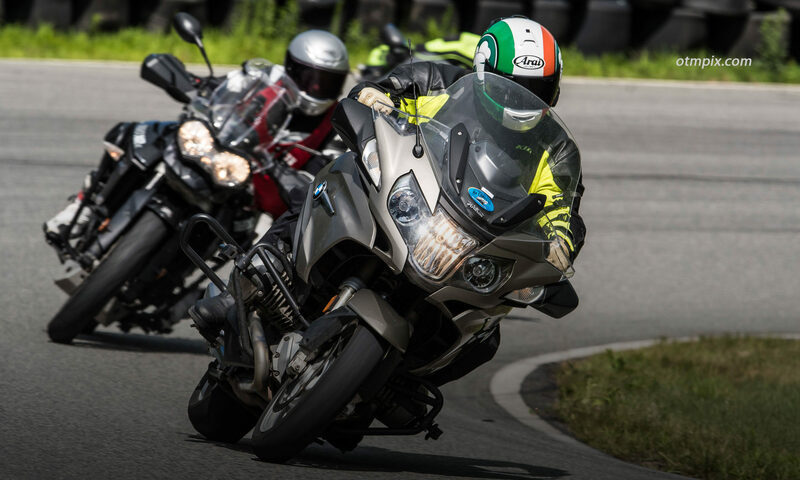 If you coast through the turn, you’re asking the front tire to not only manage the cornering forces, but also the engine braking forces caused by not getting on the gas. The amount of throttle used should be just enough to transfer load to the rear tire. Do this by gradually rolling on the throttle. DO NOT twist the throttle to the stop or you’ll overwhelm the rear tire and spin it out of control. The best riders are keenly aware of the amount of traction they have available at any given time. They also use advanced techniques that minimize abrupt spikes in load and allow the tires to maintain grip.Some of these techniques include brake and throttle overlap, trailbraking, and advanced body positions that allow the suspension to work fluidly. Start by paying attention to how load affects traction, then move on to developing these advanced techniques for load and traction management. I’ll write about these techniques in future blog posts, but you can read about them now by ordering your copy of Riding in the Zone. In the meantime, click here to read more about traction and How to Develop a Traction Sense. Share your thoughts below on how you manage traction and load. Hey ken, love your blogs, keep up the great work! Quick question, i’ve been riding for about six years now and i ride a 02 yamaha royal star classic 1300, fairly heavy bike. My question is if im not braking at all in the turn, why cant i coast through it if im hitting it at a good speed? I normally do accelerate through a turn just out of habit “from my classes,lol but never really could grasp why, if you have the momentum going into the turn, then there shouldnt be any engine breaking force on the front tire, right? Mark, It’s not about speed, it’s about load bias and how motorcycles are designed to corner best while on the gas. Even if you have good corner speed, coasting through a corner creates enough engine braking to stress the front tire (especially with a big V-Twin). But, it’s not just engine braking that pushes the front tire. 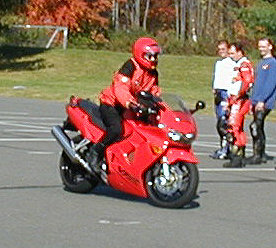 The physics of a cornering motorcycle puts the load onto the front tire as it keeps the bike tracking around the curve. Slight acceleration helps the bike track easily around the corner. Even if the physics of cornering doesn’t convince you, compare how coasting feels to rolling on the throttle throughout the turn. If you’re like most people, you will experience a more willing cornering partner if you introduce steady drive as soon as you tip into the corner. Gotcha! Thanks ken, i think i got it…i always thought that by accelerating you would be loading the front tire, i guess it’s all physics? Great book too!